The “I” Diet – also known as The Instinct Diet – was created by Dr. Susan Roberts, a weight loss researcher at Tufts University. Through the course of her research she analyzed many factors related to obesity and discovered five elements or ‘instincts’ that have an influence on the way we eat. When we understand our eating instincts we can learn to control them and this makes it easy to lose weight without experiencing hunger or deprivation. Roberts claims that you can lose 15 pounds in eight weeks by adjusting your relationship with these five instincts. The key of the Instinct Diet involves understanding the factors that trigger our eating instincts and then working with our biology to make it easy to lose weight. According to Roberts we have five intrinsic instincts that are related to our eating behaviors. Hunger: Our desire to feel full. Availability: Eating just because the food is there. Calorie density: The urge to eat high calorie foods. Familiarity: Our preference for comfort foods. Variety: The tendency to overeat when we have more choices. Stage One lasts for two weeks and has the purpose of getting your appetite under control. Roberts says that the most important factor is controlling hunger because when you are feeling satisfied it is easier to reduce your intake of calories. This is achieved by limiting the variety of foods you consume in conjunction with emphasizing foods that are high in volume, fiber, and protein. Stage Two continues for the next six weeks and allows for slightly greater flexibility. Dieters are permitted a 100-calorie treat each day and a greater variety of food choices. Stage Three is the maintenance phase of I Diet, which concentrates on reinforcing the skills that you will need so as to keep the weight off for good. By this stage you will have re-calibrated your taste buds so that you feel completely satisfied and can easily make healthy food choices. Fresh fruit and vegetables, high fiber cereal, whole wheat pasta, legumes, low-fat cheese, low-fat sour cream, nonfat milk, chicken breast, lean beef, salmon, legumes, low-fat peanut butter. The I Diet believes in the importance of exercise however Roberts states that research suggests that it has a very small effect on weight loss, so exercise is not emphasized in this book. She would prefer that dieters spend time on preparing healthy meals because this has a greater impact. In the final phase of the Instinct Diet, 15-30 minutes of exercise is encouraged each day because it helps with maintaining weight loss. 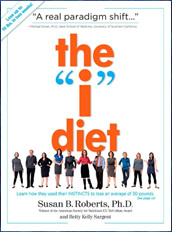 The “I” Diet: Use Your Five Food Instincts to Lose Weight and Keep it Off – Without Feeling Hungry retails at $13.95 in paperback. It was previously published in hardcover format as “The Instinct Diet” which retails for $24.95. Program is based on scientific research. Emphasizes adjusting eating behaviors for permanent weight management. Includes unique tips on how to manage food cravings. Recipes are healthy and familiar. Meal plan includes vegetarian options. Meal plans are very structured, especially in the first stages. Meal plans do not provide adequate essential fats. Some of the food items in the menus are not healthy choices. Will require time to be spent on meal planning. Calorie allowances may be too low for physically active individuals. The I Diet can help increase awareness of the triggers behind our food choices and eating behaviors. This program combines practical strategies with behavioral modification techniques while also providing dieters with education about nutrition and healthy eating.